This stitch was a little fucker. 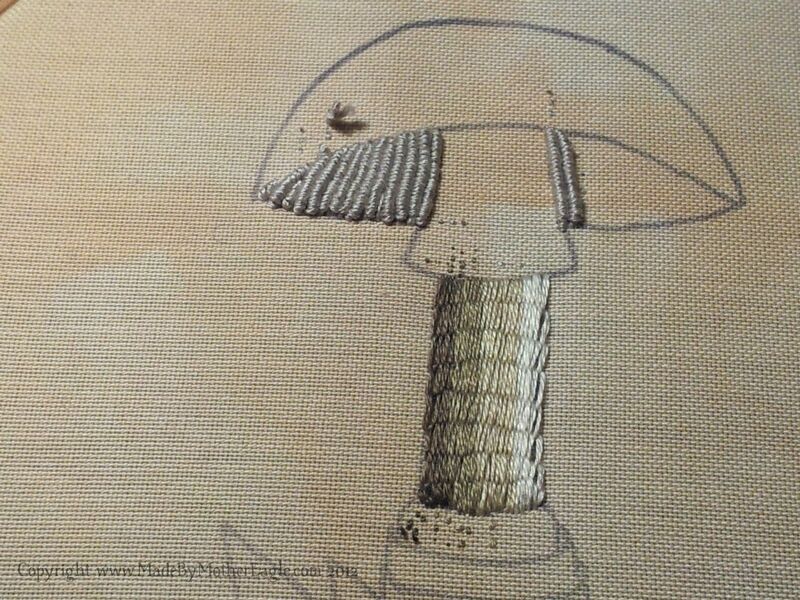 I’ve spoken before about my disgusting lack of patience with difficult things, and it was only out of sheer bloody mindedness that I knew this piece would be lacking with out the perfect texture for mushroom fins, that I persevered. 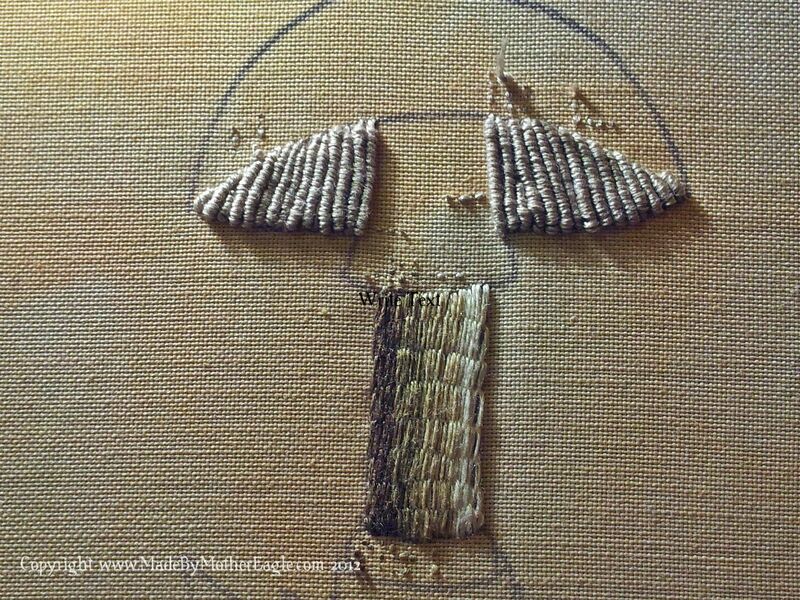 I had a piece of waste canvas hooped up to practice before I did them proper in the toadstool. 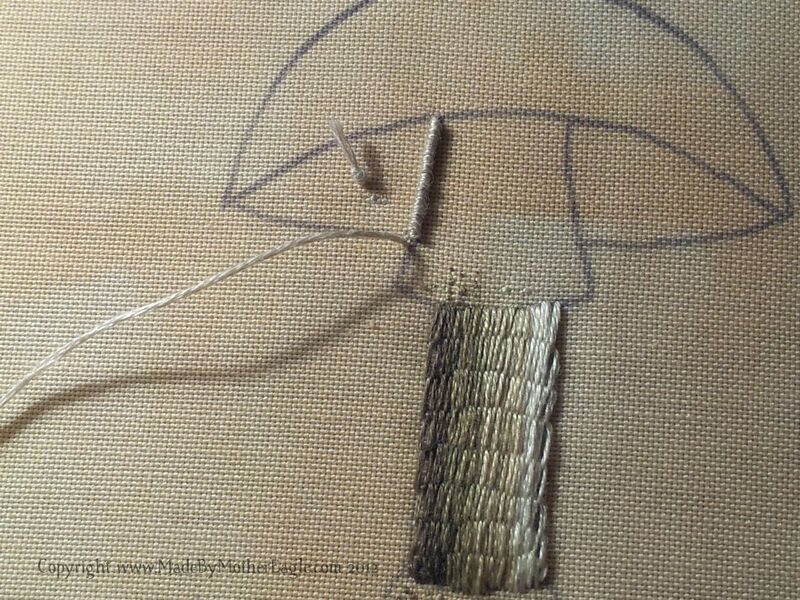 I was using 2 strands of Anchor cotton, and a Milliners No 10 needle. It recommends using no hoop, as it is a scooping stitch rather than a stabbing stitch, so I tried it on a piece of overhanging fabric I had on my practice hoop. Result: crappy stringy ratty mess. Then I tried it the same way but in the hoop. Result: crappy stringy ratty mess. Then I tried it the RSC way, in the hoop. Result: crappy stringy ratty mess. Then I got upset and threw a tantrum. Then I tried again and I don’t know what I did but I did it. I created my loop across the shape, then brought my needle back almost all the way through the first point, creating a vertical pole to which to wrap my coils. Because I followed the advice about using the Milliners needle, as recommended in the Bullions book, I had a nice long surface to get these long knots on comfortably, and an eye that doesn’t widen to pull through. Initially I had a problem with too much tension and not being able to pull the needle through, and I think a needle grip would be helpful if I was using this stitch again, as you do need a firm grip.